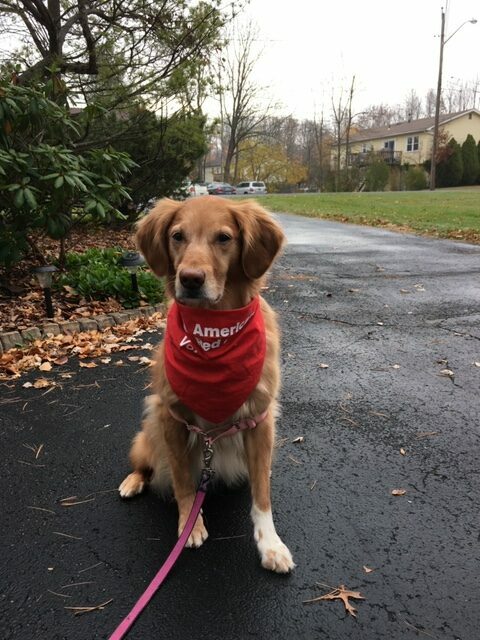 Have you heard about the volunteer dogs in the American Red Cross GNY Region? 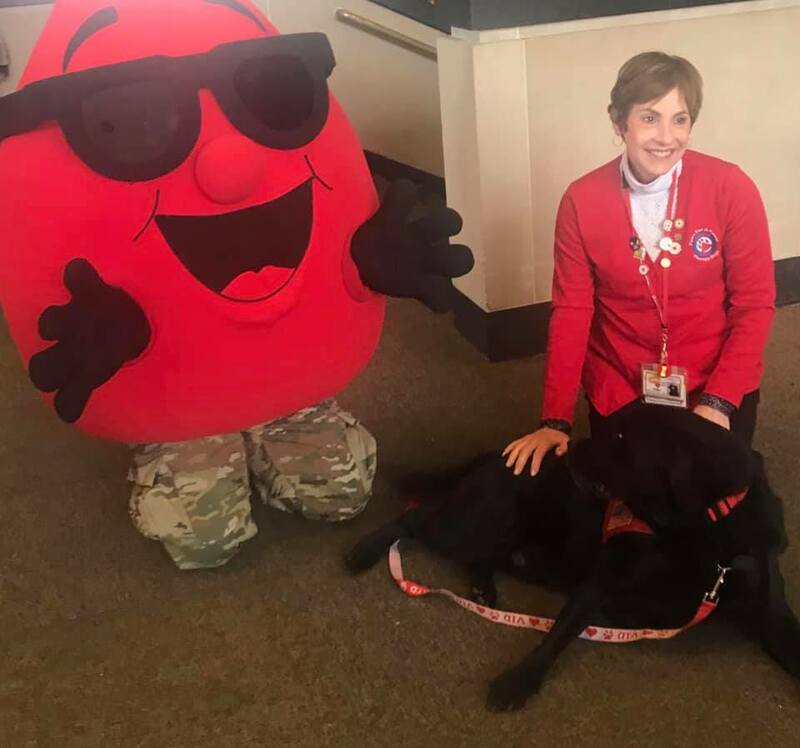 If you haven’t heard about the program within the GNY region it might be of interest for you to become familiar with our four- footed friends who help at many of the venues we take part in with the Red Cross GNY. 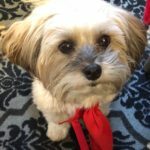 The name of the group of volunteer teams (dog and human) who do this work is, Hudson Valley Paws for a Cause. 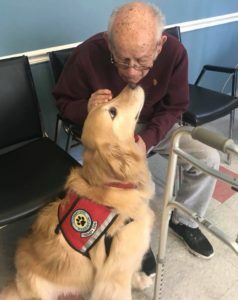 The members of Hudson Valley Paws for a Cause are certified therapy dog teams and are volunteer members of the American Red Cross. Our teams are also part of the Service to the Armed Forces branch of the American Red Cross. The duties of our dogs are many and varied. As part of the surrounding communities where we live, the teams take part in programs run by schools, libraries, nursing homes, hospitals, assisted living facilities and hospice, to name a few. Our dogs are welcomed guests who say hello to patients and share their unconditional love and enjoy the petting and hugs they receive. It is documented that dogs help lower blood pressure and speed healing for those in need when included in these programs. The teams who participate in school programs listen to children read and take part in lessons prepared by teachers. 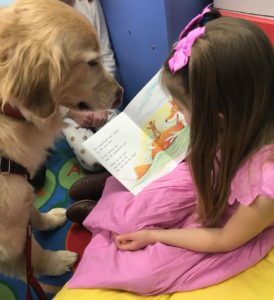 Again, it is documented that childrens’ reading improves when the dogs are present. Those children who participate in programs for those with emotional needs show improvement in areas where they are deficient. We are also privileged to be part of the Service to the Armed Forces. The members of Hudson Valley Paws for a Cause are invited to events at West Point Military Academy in West Point, NY. Before funding was cut, our group helped soldiers returning from deployment overseas as part of the Warrior in Transition Unit. 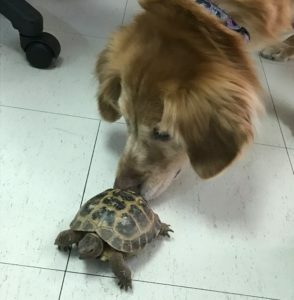 The dogs played an important part in the program in ways that humans could not. The dogs put smiles on many faces that haven’t smiled in weeks and helped those soldiers who needed to tell their story to non-judgemental ears. We did make progress and were very proud of that, but unfortunately the money for the program was not there after two years. Our group then participated in an afterschool program at the Army Community Center. 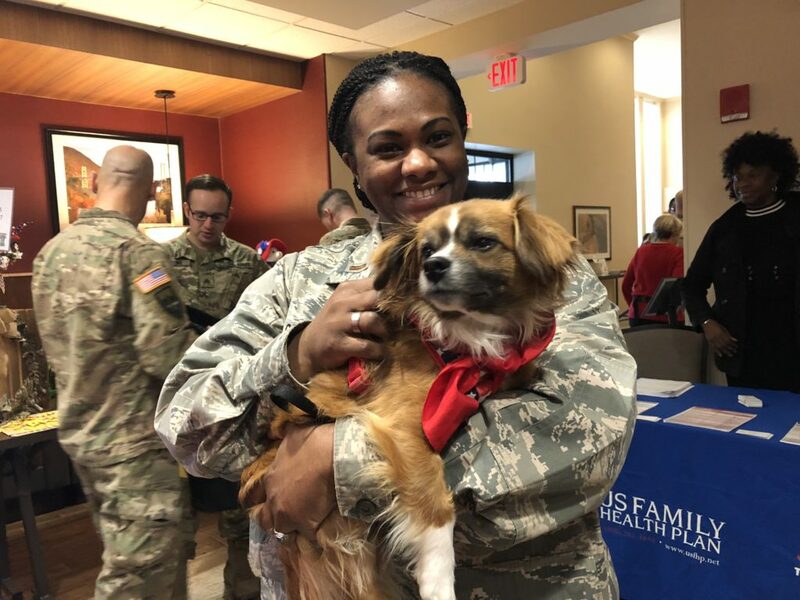 The center opened their doors to the dogs in order to help children who were struggling emotionally with having one parent deployed overseas. Again, we were a welcomed part of this special program. This program was opened to families from all branches of US Armed Forces. Currently, we visit Cadets monthly and on special occasions such as blood drives and before exam periods. This is a great stress reducer for the Cadets and they are thrilled to see us. We are also invited to many yellow ribbon and deployment events during the year. We have gone to events in rewarding feeling of giving back to the community and the satisfaction of helping those in need we get perks!!!!!! Yes, perks. 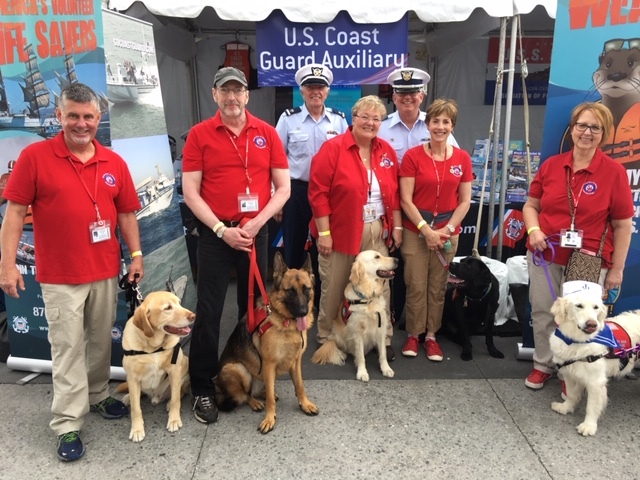 We march in the Veterans Day Parade in NYC, with the Red Cross, participate in events at the Intrepid Air and Space Museum in NYC with the Red Cross and we are invited to participate in the 9/11 fun run and family day in lower Manhattan in April. 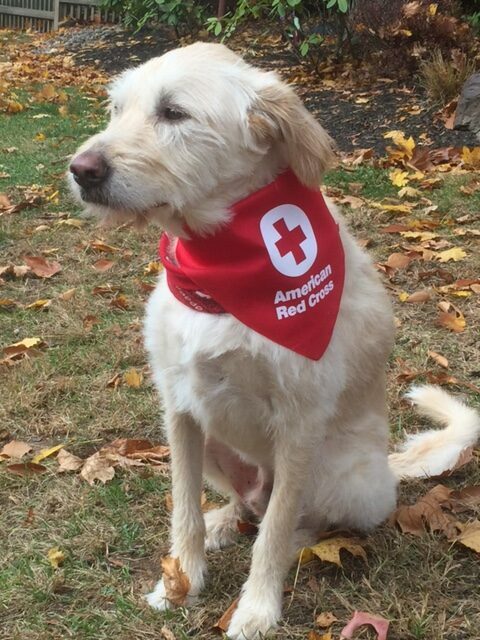 I hope you have gotten the idea of how Hudson Valley Paws for a Cause is involved with the American Red Cross. Don’t be shy when you see us. Come over and pet the dogs, introduce yourselves, tell us about your dog or dogs. If you are interested in our program let us know and we can get you started!!!!!! The more the merrier. We are a happy bunch!